How is DNA Sequencing Used in Cancer Therapy? Cancer therapy is increasingly aimed at the fundamental abnormalities within cancer cells – the genes and proteins that normally keep cell division under control, but are damaged or faulty in tumor cells. To understand which genes are abnormal, where they’re located within the genome, and how they affect cell growth, doctors and scientists use a procedure called DNA sequencing. Sequencing DNA involves determining the precise order of the four chemical building blocks, or “bases,” that make up the DNA molecule. The bases – designated A, C, T, and G for the first letters of their chemical names ­– spell out the genetic code for each cell and each organism. Human cells have about six billion bases in all, arranged in pairs along the entire length of DNA. That figure is roughly equal to six gigabytes of data, or the number of letters in a book with three million pages. Do I Need Genetic Testing to Assess My Cancer Risk? Knowing the sequence of bases – also called nucleotides – helps scientists understand how different segments of DNA function. Some segments contain genes, which are blueprints for proteins produced by the cell. Other segments – more numerous and occupying vastly more space than genes – control whether genes are switched on or off. That is, they determine whether genes are actively being “read” by the cell to produce proteins, or are merely “on file” in the nucleus. Other regions of DNA have no known function and may be holdovers from evolutionary wrong turns and detours. DNA sequencing explores the fundamental abnormalities within cancer cells. Since DNA constitutes the “operating manual” of cells, errors in the arrangement of bases can cause a cell to malfunction in a variety of ways. Nowhere is that more evident than in cancer, the disease most associated with wayward genes. The kind of sequencing errors that crop up in cancer cells can take several forms. These include mutations, in which one base is incorrectly swapped for another; copy number alterations, in which a gene or section of gene is repeated over and over or is missing altogether; and translocations, in which a stretch of DNA becomes stranded in the wrong part of the genome. How is DNA Sequencing Used in Cancer Care? Not every genetic misspelling or abnormality results in cancer. Many have no discernible effect on a cell’s function. But certain abnormalities are hallmarks of certain kinds of cancer. Doctors know, for example, that many non-small cell lung cancers (NSCLCs) have mutations in the gene EGFR. Targeted drugs are available that counter the effect of some of those mutations. By sequencing tumor cells from patients with NSCLC, therefore, doctors can often identify patients who are likely to benefit from those drugs. Although the cost of DNA sequencing has dropped dramatically in recent years, it often isn’t feasible or affordable, or even necessary, to sequence all 3 billion base pairs within tumor cells. That’s why much of the sequencing done today is “whole exome sequencing,” which involves reading the bases only in sections of DNA that code for proteins. At Dana-Farber, sequencing is the centerpiece of the Profile program, in which patients’ tumor tissue is scanned for hundreds of mutations or other abnormalities linked to cancer. The results of these scans can indicate patients who are good candidates for targeted therapies or for clinical trials in which potential new therapies are being tested. 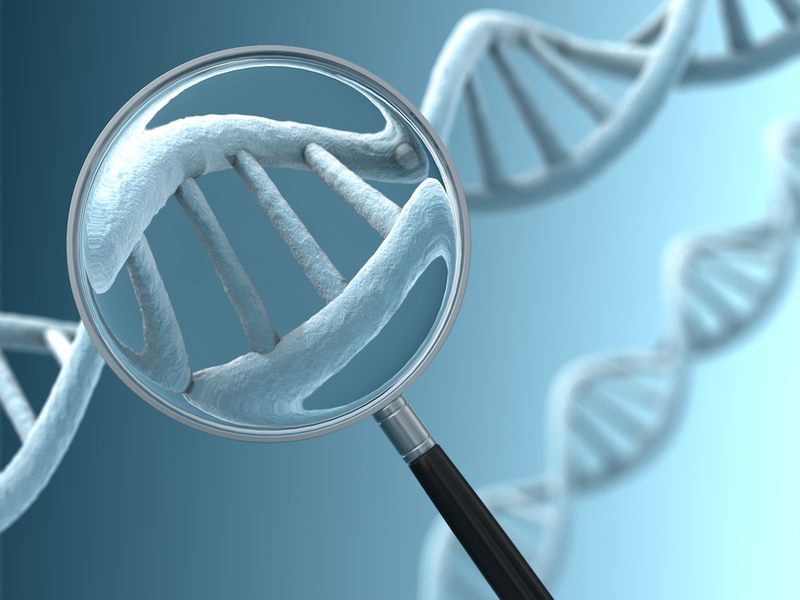 DNA sequencing can also be used to identify people who may be at risk for certain types of inherited cancers. Scanning normal cells for mutations in the genes BRCA1 or BRCA2, for example, can indicate whether an individual has an above-average chance of developing cancers associated with those mutations. If so, there are a variety of measures such individuals can take to reduce their risk. Sequencing plays a large role in cancer research as well. Projects such as The Cancer Genome Atlas are sequencing thousands of tumor tissue samples to help uncover which genetic irregularities drive the growth of various types of cancer. Sequencing can also help researchers track how cancers change their genomic stripes over time. By sequencing the DNA in a tumor before and after treatment, for example, researchers hope to learn how cancer adapts to treatment and potentially becomes resistant to it. An example of this use of sequencing is the PCROWD study at the Center for Prevention of Progression of Blood Cancers at Dana-Farber. Researchers are collecting tissue samples from people with precursor blood conditions, which develop into hematological cancers such as multiple myeloma and Waldenström macroglobulinemia, as well as other blood disorders. By genetically sequencing the cells in these samples, researchers hope to understand how these disorders evolve and to develop targeted drugs able to stop this progression in its tracks.